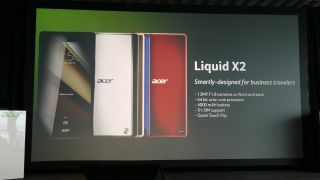 Acer has just revealed a new smartphone called the Liquid X2. Why should you care? Because it has a crazy big battery. We often complain about the battery life in current phones, but Acer's cramming an impressive 4,000mAh pack into the Liquid handset which should give you hundreds and hundreds of hours of standby time. It also has tri-SIM support for all your intrepid travellers, as well as a 64 bit octa-core processor, and 13MP F1.8 cameras on both the front and back. We'll be having a play with it shortly, so hold tight.